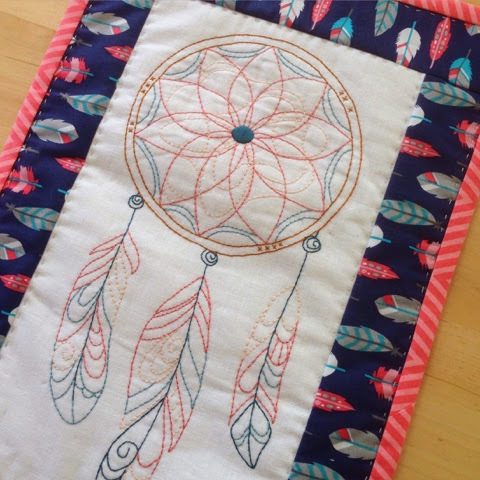 My dream catcher embroidery mini quilt is finished. Yay! This was such a fun embroidery project and I enjoined trying to match my thread colour with the border fabric. Isn't this feather fabric lovely? I found it a while back at Spotlight and when I saw that my "Schnitzel & Boo" swap partner liked feathers, I knew this was perfect. I hand quilted it with a variegated silver/grey 12 weight cotton by Aurifil. This little quilt is now winging its way over the ocean to my partner. I really hope she likes it. The embroidery pattern is available from the Urban Threads website. I warn you though, if you like funky embroidery patterns, you will spend ages at Urban Threads (and a small fortune). I've bought so many patterns from there. Now if only I had the time to stitch everything! Thanks Shez. It was such fun to make. I’m keeping an eye out on the swap hashtag on Instagram to see if my partner has received it. Looks great, Anorina. The border fabric is just perfect. Lovely! And you are correct, the border fabric is just right for the stitchery. Or is it vice versa? LOL - I think it's vice versa. I had the fabric first and then chose the floss colours to match the fabric.